As the weather heats up, truck drivers won’t have to deal with icy roads or devastating blizzards. However, summer still can present challenges, especially to drivers who don’t pay careful attention to their surroundings. Brushing up on a few summer driving tips for truck drivers can help you avoid disaster. If you drive for long periods of time with your left arm resting on the truck door, you’ll likely develop a peculiar tan confined to that arm (sometimes called trucker’s arm). Although your tan may raise a few amused eyebrows, avoiding sunburn is a good way to lower your chances of developing skin cancer. 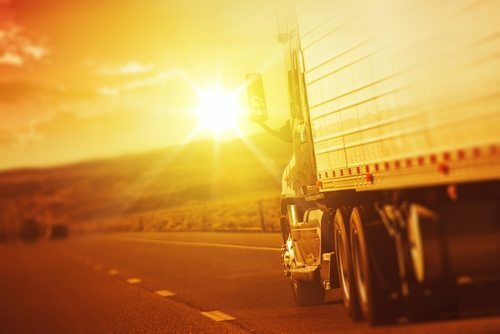 Getting in the habit of using sun screen daily is just one of a few summer driving tips for truck drivers that can help you protect your health. Sun glare can be a persistent problem in the summer, especially if you spend long amounts of time driving east or west. Invest in a good pair of polarized sunglasses to protect your eyes from damage and to cut down on glare and dazzle. Sunlight reflecting off the road can be especially dangerous if you drive in the early morning or late evening. Without adequate protection, you may not be able to see clearly and could miss obstacles on the road. During the summer months, many families choose to take road trips for vacations, potentially leading to heavy congestion on freeways. Summer weather is also a favored time for road projects. Depending on how complex a construction project is, you may be forced to detour onto unfamiliar roads. Taking the time to check traffic conditions before you get on the road can help you avoid delays. Don’t forget to stay alert as you drive through areas under construction; follow all signs and watch out for road workers. Fines for traffic violations are often twice as high in construction zones. On a hot day, even the air conditioner is not enough to keep the symptoms of dehydration at bay. Keep a bottle of water handy at all times, and get in the habit of taking a drink even when you’re not thirsty. You should also brush up on the signs of heat stroke so that you can determine if you’re in trouble and need to get off the road to seek help. Symptoms of heat stroke include headaches, muscle cramps, and dizziness. Summer weather can be unpredictable, especially in certain areas of the country. Tornadoes, monsoons, and thunderstorms are extreme weather events that sometimes occur without warning. Always check the weather forecast for your route, and heed warnings from local traffic authorities. Don’t underestimate the power of a summer storm; a flash flood on the road could strand you and your vehicle. In extreme heat, your truck’s components may suffer mechanical issues. Tire blowouts, for example, can be caused by heat. If you’re vigilant about keeping your tires inflated at the correct level, your risk of a blowout will go down. Heat can also affect your truck’s brakes, potentially causing them to not work properly. Make sure to check them frequently and get them fixed before a small problem grows. Finally, soaring temperatures can cause your engine to overheat more easily; on especially hot days, you may need to slow down when climbing hills to prevent your engine from overheating. Summer driving is not without its challenges. Adopting a few summer driving tips for truck drivers can help you avoid issues with your personal health and your vehicle’s well-being.